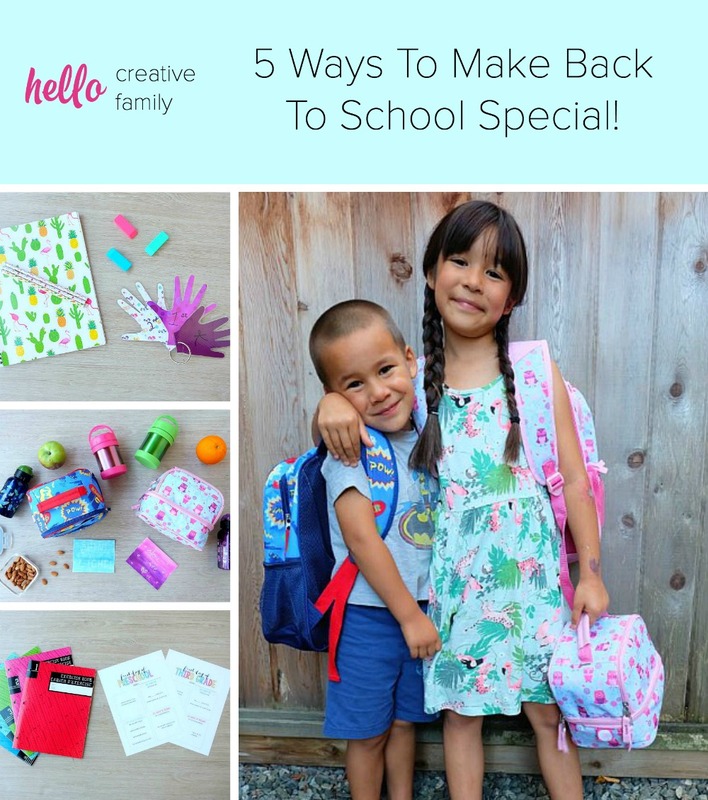 5 Ways To Make Back To School Special! Can someone please tell me where this summer has gone? I feel like it’s been a “blink and you’ll miss it” type of summer! I remember at the beginning of school vacation, worrying over keeping the kids occupied over the seemingly vast amount of school free days that loomed ahead, and now I’m lamenting the passing of each day that brings us closer to September and the return of a “normal” schedule. I remember, as a child, facing back to school with a mixture of trepidation and excitement. I hated leaving the summer months behind, the feeling of freedom, of having all the time in the world, the long days of swimming in the community pool and laying in a sun chair reading countless books. Back to school was also exciting. Each year offered a brand new beginning– New clothes, the potential for making new friends, new teacher, new classroom and new routine! My mom also accomplished something amazing at the beginning of each school year. Even though money was tight and we didn’t get everything we wanted on our “back to school” wish list, she always found ways to make back to school feel extra special. That’s a feeling that I’ve always strived to pass along to my children. I want them to know how special they are, how much I love them and how they make my life complete. I think it’s a feeling that most parents want to give to their children– You are special and you are loved. Today I thought I would share with you 5 ways to make back to school special. Read on for my ideas. 1. Make a first day of school sign and take their picture with it. 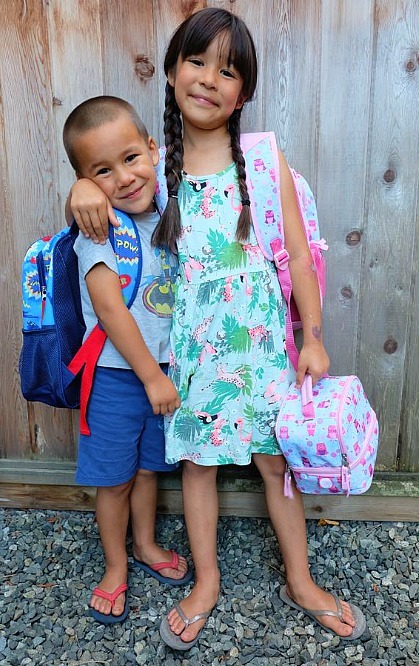 One of my favorite things to do on the first day of school is take pictures of my kids. I love snapping shots of them by themselves, the two kids together and pictures of them with their best buddies. 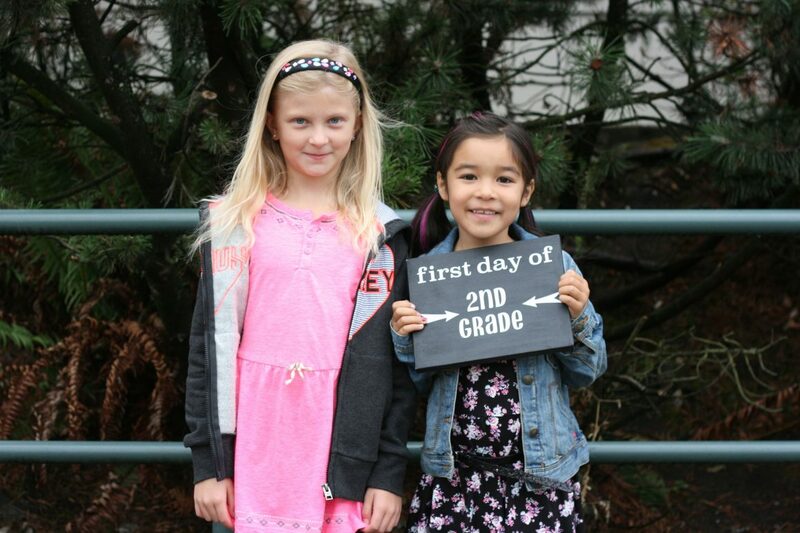 I know that one day, it’s going to be foggy which picture was taken which year, so I always make a “first day of school” sign that the kids hold in the photos. I use an 8″X10″ piece of stretched canvas from the dollar store that I painted over with black chalkboard paint. The first year I wrote the grade in chalk but it rained and the chalk quickly washed away. The past 2 years I’ve cut out vinyl on my Cricut to put on the sign. I just peel of the vinyl and replace the grade number each year. My kids feel special having a sign that I made just for them, and they have fun posing with their friends too! I know that when dear friends move away, these photos will help them hold onto the memories. 2. Make a handprint from their first day of school each year. This is a tradition that I started with Bean the year she started kindergarten, that I plan to continue straight through high school. The week before the first day of school I take the kids to Michaels and have them pick out any piece of scrapbook paper that they want. I tell them to pick their favorite or one that they think represents something they love that year. On the first day of school I trace their hand on the scrapbook paper, cut it out, laminate it, punch it with a hole punch and put it on a binder ring. Already after just a couple of years, it’s fun to see how much Bean’s little hands have grown! 3. 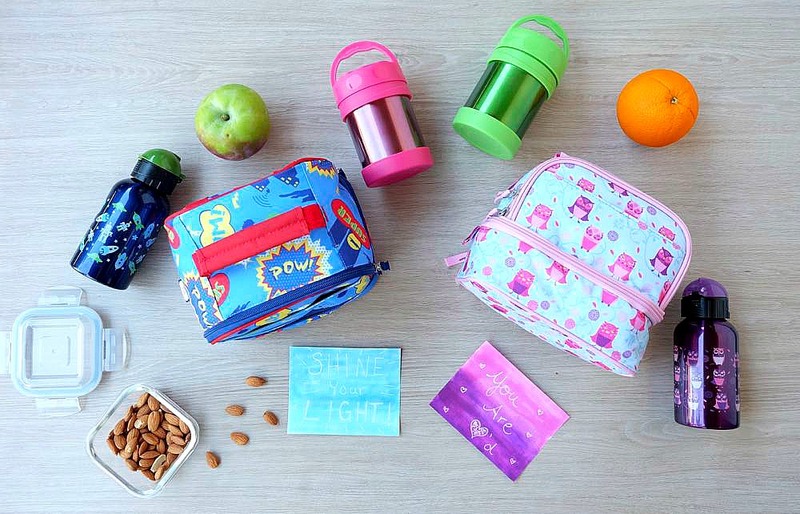 Pack a note in their lunchbox to let them know you care. When I was a kid my mom used to draw on my lunch bag. I don’t quite have the talent that my mom had in the drawing department, and my kids use re-usable lunch bags but I still like to do a little something so they know that I’m thinking about them during the school day. Our Secret Message Notecards are an easy DIY way to send your kiddo to school with an inspirational note in their lunchbox. Not feeling quite so crafty? Kristen Duke has some adorable free printable lunchbox jokes on her site Capturing Joy, that your kiddos will adore! Print a bunch up at once and have them ready to go for lunch each day. 4. Have them fill in a “First Day Of School” questionnaire and see how much their answers change (or stay the same) from year to year. One of my favorite stories to tell about my kids is about how I asked them what they wanted to be when they grew up when they were 3 years old. Bean, at age 3, told me that she wanted to be an animal behaviourist. Turtle, at the same age, told me that he wanted to be a TV watcher. I think it’s pretty fun to ask kids questions, keep track of them and see how they change from one year to the next. The start of a new school year is the perfect reminder to make one! Head on over to Pinterest and you’ll have a huge range of first day of school printables to choose from. I personally love the one from Yellow Bliss Road. 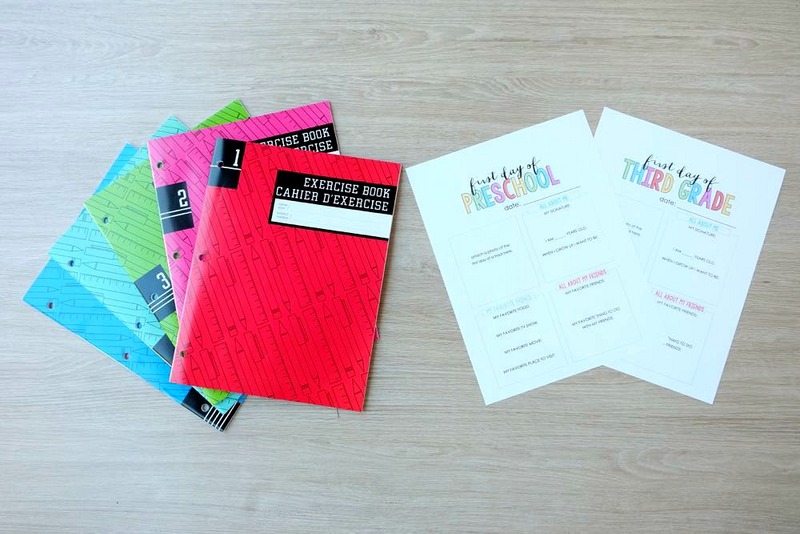 It’s a free “All About Me” printable for each grade from kindergarten to grade 12. Put the paper in a binder to keep them year after year, or, I love the idea of getting a notebook, pasting the first day of school questionnaire on the front page and then adding favorite pieces of school work and memories throughout the rest of the year. 5. Let them pick out an item or two that reflects their personality. 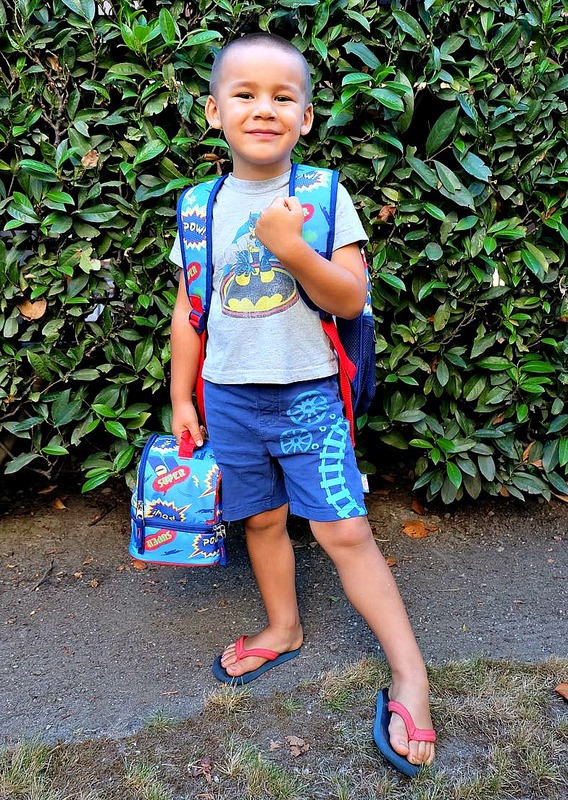 I’m a firm believer that you don’t need to spend a ton of money to make your kid feel special, but I love the idea of letting my kids pick out a few things at the beginning of each school year that reflect their personality and personal style. This year, we did our back to school shopping from the Home collection from Real Canadian Superstore. 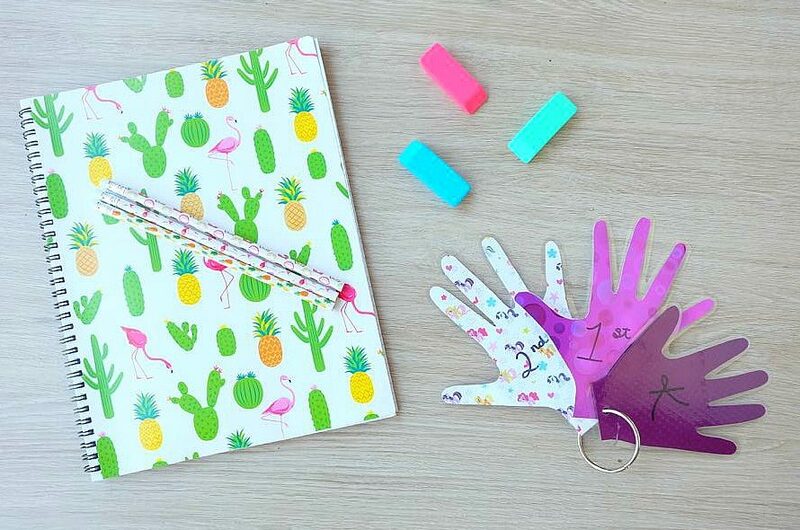 Not only are the prices great, they also have a wide variety of colors and patterns in everything from backpacks and lunch bags to water bottles, notebooks and pencils! Turtle will be starting his first year of pre-school this year. He’s a shy kid who has gone to a family daycare since he was a baby. This will be a big change for him. I know he’s excited about getting a fresh start but also nervous about making new friends. What better way to break the ice then by connecting over a shared interest? Turtle picked a superhero backpack and a robot water bottle because they are two of his (and most 4 year old boys who I know) favorite things. I have no doubt that his new backpack will help him strike up a conversation on the first day of pre-school. Bean has always been an animal lover, so an owl backpack and water bottle were her choices for new back to school gear. 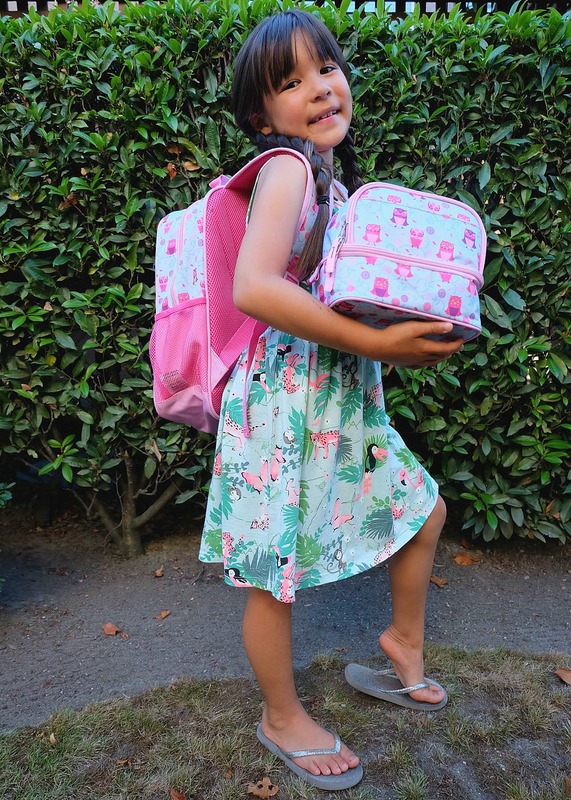 She loved how unique the design was and that there were a few different backpack designs with animals in the Home collection so that her and her animal loving friends could pick different ones. 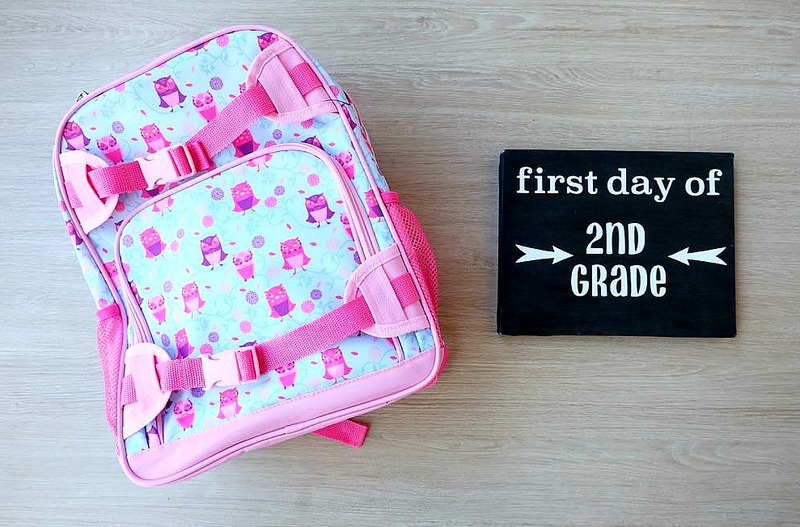 Whether you have a little one starting preschool, or are sending a child away to university to live in a dorm, Real Canadian Superstore’s Home collection has all of your back to school essentials so that you can help your kiddo start fresh and feel extra special! Disclosure: Thank you to Real Canadian Superstore for working with us on this post. As with every article on Hello Creative Family, all thoughts and opinions are 100% our own! We only share things that we love with you guys!